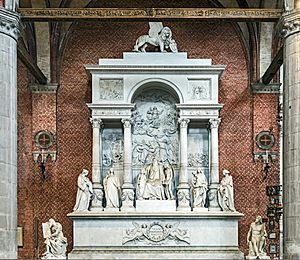 Tomb of Titian in Venice. Tiziano Vecellio (sometimes his last name is given as Vecelli, born around 1490,in Pieve di Cadore near Belluno, died 27 August 1576 in Venice) was a painter. His name in English is Titian. He was one of the leading painters of the 16th century Venetian school; he is also seen as one of the principal artists of High Renaissance painting of the 16th century. When he was alive, he was often called Da Cadore, after his place of birth. When he was active, the Republic of Venice had a Golden Age, and was well-off economically. Aged nine, Titian went to Venice. The brothers Gentile and Giovanni Bellini taught him how to paint. In 1513, he opened his own shop, and developed into a successul painter, known all over Europe. In 1533, Charles V made him a nobleman. He also obtained a job as a painter at the court of Charles V. In 1545, Pope Paul III invited him to come to Rome, in 1548 and 1550, Titian accompanied Charles V and his son, Philip II to the Diet of Augsburg. 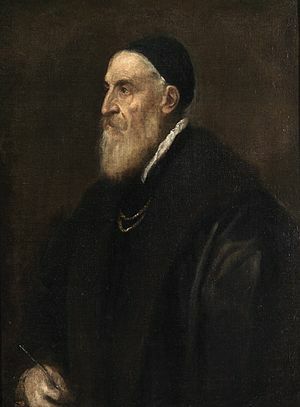 When Titian died of the Plague in the year 1576, he was an old man. He was also one of the most famous painters of Venetian history. Titian was very productive: in total, he painted 676 works. He did portraits, landscapes, as well as themes from mythology and religious works. All his works are very colorful. This special use of color influenced other painters of the same period a great deal. His works influenced painters such as Peter Paul Rubens, Antoine Watteau and Eugène Delacroix. A self-portrait, done around 1510. For a long time, it was attributed to Ariosto. Rembrandt also used this composition for his self-portraits. Salome, or Judith; this also shows an idealized portrait of beauty, which Titian developed. Titian often used Venetian courtesans as models. Titian Facts for Kids. Kiddle Encyclopedia.